We purcashed some braided rear brake hoses to replace the rubber ones from Goodridge, but I can't figure out how to fit them! I presume that the banjo bolt goes to the subframe end, but I can't figure out the best way of routing this. If I route it as below it a) doesn't seem right and b) won't reach the wheel cylinder! I've posted a question on the Mini forum at http://www.theminiforum.co.uk/forums/index.php?showtopic=126813 so we'll see if any of the helpful folk on there can shed any light. 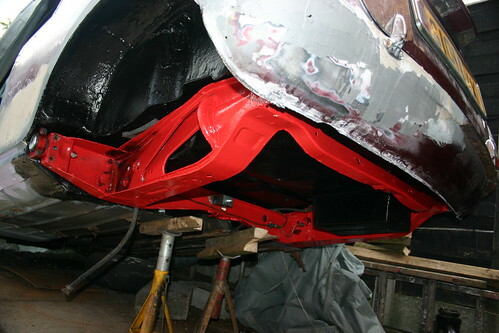 Today was at long last the day to refit the rear subframe. It seems like a long time ago that I dropped the rusty old one down from the car (because it was). After our trial run last week I was confident that things would go smoothly. It was quite plain sailing as I had to remove the rear trunnions to get it past the rear valance, but after another period of levering (and cursing at the sky as it started to rain) it all went in. Before fitting the subframe I painted the top of it and the vunerable areas with waxoyl and I made some mounting pads out of neoprene. 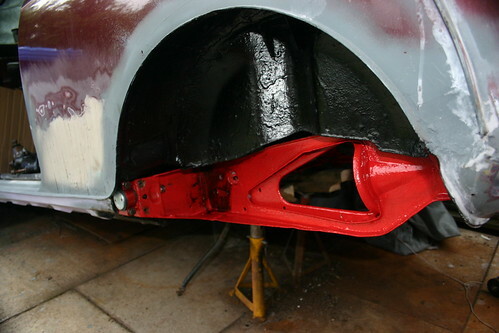 These get sandwiched between the subframe and the car and help to prevent noise and vibration. 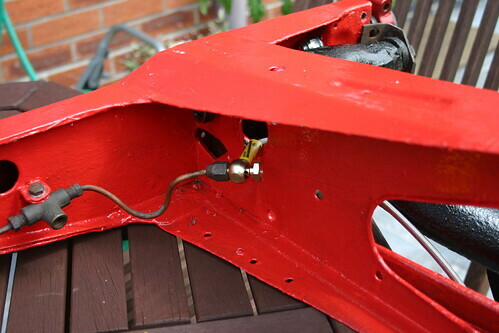 The new bolts were all also liberally doused in copper grease to make removing them in future easier. Next I need to rebuild the rear radius arms and then move onto sorting the floorpans properly.